Six months after buying his house, author Scott Drake wonders if he's sharing it with a spirit when, nightly, he hears the sounds of a car crash on the road in front of it. Then he sees the reflection of a man behind him in the windows. Jack Weaver, Scott's online friend, suggests he research the house's history. Then, intrigued by what Scott discovers, he pays him a visit. 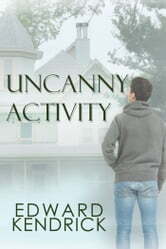 As the two men work to discover who--or what--is sharing the house with Scott, their previously long-distance friendship begins to blossom into more. Can they survive what they discover? And if they do, will the fact that they live hundreds of miles apart destroy any chance of love between them? This book also includes Ryker Savage, Vampire PI by Scott Drake. Can Ryker keep Mason Fox safe from a stalker and avoid falling in love in the process?